Seasonal Occurrence: Common spring through fall. Nests in our area. Profile by Vicki Stittleburg: Our most widely distributed swallow, the Barn Swallow has bluish black upperparts, rust to buff colored underparts, a blue crown, nape and ear patch, orange forehead, cheek and throat, long pointed wings, and a long, deeply forked tail. Males are more brightly colored than females. 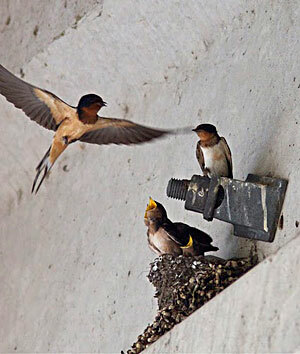 Barn Swallows once nested in entrances to caves and on cliffs and in tree hollows, but now their cup-shaped mud nests are built almost exclusively on man made structures and can be found under house eaves, in barns and boathouses, and under bridges. 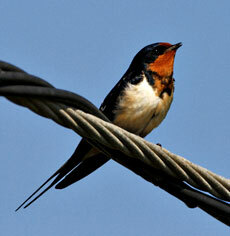 Aerial acrobats, Barn Swallows catch flying insects on the wing. Flies make up the majority of their diet, but they also consume beetles, bees, wasps, ants, butterflies, and moths. Barn Swallows are most common in late summer and fall, especially in coastal regions. 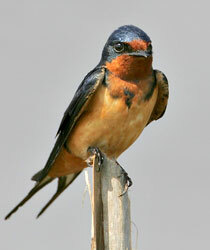 You can find the adaptable Barn Swallow feeding in open habitats from fields, parks, and roadway edges to marshes, meadows, ponds, and coastal waters.